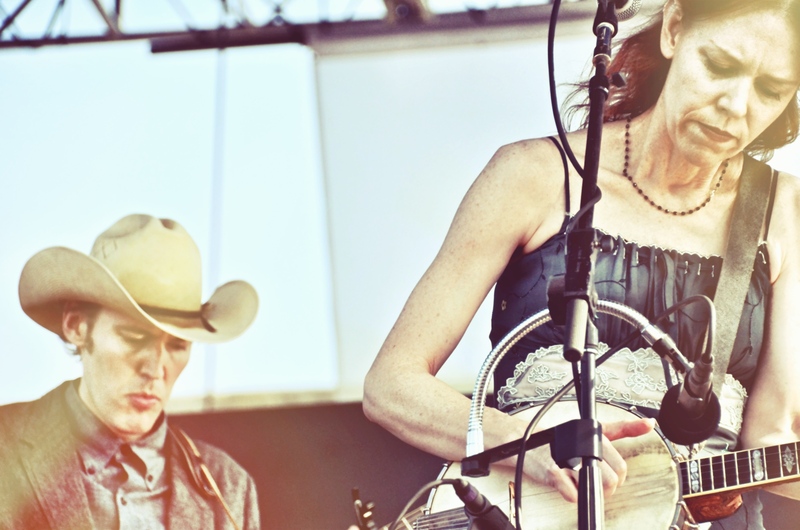 Gillian Welch & David Rawlings. – Richard Kluver, grass clipping blog. All rights reserved. Last weekend as 10,000 festivarians filled Newport’s Fort Adams State Park, I got the chance to catch up with Jay Sweet, producer of the Newport Folk Festival since 2008. In that first year on the job, Jay told his team that they would sell the festival out in three years…and that’s what happened. Shortly after we met, I figured out one of the reasons he was able to pull that off. Jay, who is also editor at large at Paste Magazine, is a bit of a celebrity. All of the staffers know him (he didn’t wear a badge and no one stopped him at any of the checkpoints we hit). All of the artists know him. Everyone knows him. People were lining up to get time with him. The guy is loaded with energy and a deep passion for perfecting the festival. As we walked from stage to stage, I tried to get an idea of how Jay and the other festival organizers assembled the lineup. I asked if he tried to think about all of the stereotypes that come to this festival and which bands would get them there (so, the folkin’-since-the-60s-fanny-pack-donning-baby-boomers, the Ray-Ban-wearing-hipster-twenty-somethings, the Newport-yuppies-with-whales-on-their-belts, etc.). “No,” he said. “It’s a simple three step process.” First off, he frankly said, the bands have to want to play the Festival to make the lineup. While festivals like Bonnaroo, Coachella and Lollapalooza have massive budgets to throw around and book headliners, the entire Newport budget could easily be swallowed by one artist. However, Jay says that many bands are willing to make it work for less because they want to be there. The other steps are pretty simple: Jay and the other organizers have to want the bands that play and so do the folks buying tickets. While there’s a vetting process with a core group of people in Jay’s network, some of the bookings were on-the-spot asks by Jay immediately after seeing bands perform. So, what kinds of bands do the fans and organizers want? I asked how he would group some of the fresh faces on the lineup. I thought most could fit into a sub-category of “emotional folk.” Jay puts them more in a bucket of authenticity. “A few years ago, I would have called hip hop the most authentic genre.” While he points to the festival’s 365-days-per-year social media community as the reason why the show sold out this year, he notes that the authentic lyrics and performances that are coming from new, burgeoning folk bands on this year’s lineup, such as The Head and The Heart, TYPHOON and River City Extension, are consistent with the themes desired by our culture today – across the arts. But the festival doesn’t overlook the history that drives many to Newport every year. “I always want to pay homage to the legacy of those that were here in the early years,” Jay said. With acts like Pete Seeger, Earl Scruggs, Rambilin Jack and Emmylou Harris at the festival this year, and Doc Watson and John Prine at last year’s festival, nostalgic folk fans had plenty to feast on in Newport. As Paste marked with its #1 spot in the 10 Best Moments post, it’s the mix of the old legacy and the new authenticity that represents the best of the festival. Those are the moments that made fans feel like we’re a part of history. That’s the kind of stuff that we want to tell our friends, coworkers, and grandkids about. That’s the kind of stuff that makes the festival what it is… why bands want to be there…and what will sell tickets for next year. As we close on our coverage of Newport this year, here’s a roundup of our photos and a few of my favorite videos that have posted throughout the week. That’s a wrap. All photos by Richard Kluver of the grass clipping blog. All rights reserved.